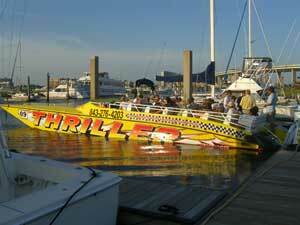 THRILLER – Charleston’s only public off-shore tour boat. 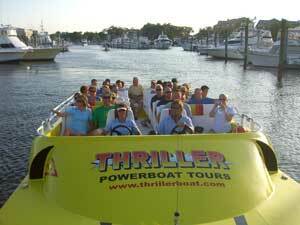 THRILLER Charleston is a 43 passenger power catamaran that takes you on a 1 hour ~25 mile off-shore adventure as we make our way to the Morris Island Lighthouse for a ride not offered by any other public tour boat. A perfect mix of live narration and rock music as we tour by 5 forts, 2 lighthouses and have a fun ride out in the ocean. If you like Thriller Charleston on Facebook, you can save 10% when you buy Thriller Tickets online (not including the Sleigh Ride). 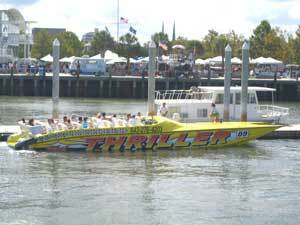 Duration and routes vary depending on weather and tides. For more information visit www.thrillercharleston.com.